Ivan is an easy-going gorilla who is used to humans watching his every move through the glass of his cage. He can hardly remember his life is the jungle or what happened to his family. That is, until a baby elephant called Ruby arrives. Suddenly Ivan sees his home through new eyes and knows he must do something to make sure Ruby doesn’t end up like him. Ivan is a very friendly and caring gorilla. Ivan grew up in a video arcade in exit 8. Ivan LOVES art and TV shows and just because of that he saved himself and one of his baby elephant friends called Ruby. 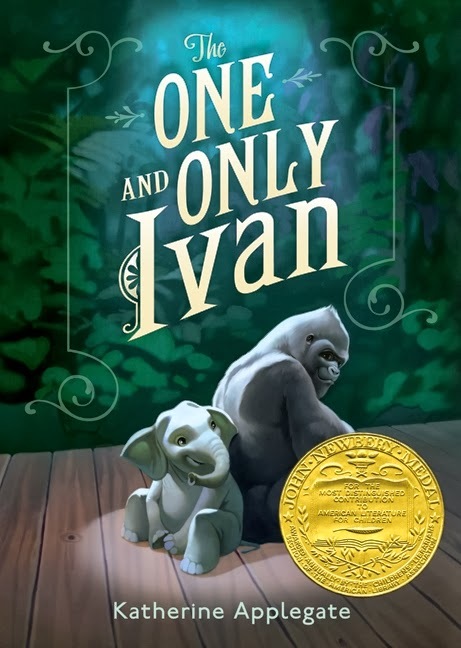 This all happened when they were in a prison, slowly Ivan’s life started to change because of his little friend. Ivan has many friends here at the mall, and Stella the elephant is one of them. A long time ago the mall was the most popular place around, but things have changed from then and there are no more big crowds coming in, so Ivan becomes very bored. His poor friend Stella is sick, and Ivan has nothing to do except sit around and hope Stella will get better. The owner of the mall Mack doesn’t have enough money to pay for Stella’s sickness or to advertise it and hope he will earn some money. One day Mack is tired of Stella being sick and not earning any money, so he decides to buy a baby elephant, and he hopes that the baby elephant will attract people. When the elephant arrived they named her Ruby and she quickly left to go bond with Stella. Stella never had the chance to be a mother because she has been in a cage for so many years now, but Stella would have made an excellent parent because she was handling Ruby very well and so Stella became a mother. Unfortunately Stella died from her foot infection and Mack was ignoring her reactions. Before Stella died she asked Ivan if he could look after Ruby and take her away from all the cages. Ruby grew a bit older and is a wonderful little elephant. Ruby asked Ivan many questions about his childhood, and was always very interested in every story he told. Ruby helped Ivan remember his life when he was still an infant. Ivan took a long time to remember what happened back then, but Ruby helped him by asking more questions and so he remembered his friends, family, home and how he ended up in this place. Yellow Hat (Positive): I like this book because it shows that little things can actually change someone’s life and that it is important to treat everybody with kindness, which Ivan did perfectly. This book also had a lot of mystery and unexpected things planned. I think this book is really good because it is based on a true story that is about friendship, love, and hope. This book was very interesting and I learned a lot of facts about gorillas and other animals from it too. Black Hat (Negative): This book was wonderful, but it didn’t have paragraphs it just had sentences so it made the book really easy to read. I rate this Book 4/5!!! - This review by Charlotte Hanekom, a member of the St Mary's Catholic Primary School Kalgoorlie Book Club. Thanks for sharing a very thorough review, Charlotte. This book sounds so interesting. This sounds like a very sad but interesting story. Thanks for your wonderful review, Charlotte. This is a really comprehensive and enjoyable review, Charlotte--well done. I am so keen to read this book now! !